America was a 19th-century racing yacht and first winner of the America's Cup international sailing trophy. On August 22, 1851, America won the Royal Yacht Squadron's 53-mile (85 km) regatta around the Isle of Wight by 18 minutes. The Squadron's "One Hundred Sovereign Cup" or "£100 Cup", mistakenly known in America as the "One Hundred Guinea Cup," was later renamed after the original winning yacht. A syndicate of New York Yacht Club members, headed by NYYC charter member Commodore John Cox Stevens, with members Edwin A. Stevens, George Schuyler, Hamilton Wilkes, and J. Beekman Finley, would build a yacht to sail to England. The purpose of this visit was twofold: to show off U.S. shipbuilding skill and make money through competing in yachting regattas. Stevens employed the services of the shipyard of William Brown and his chief designer, George Steers. America 1851, by James Bard. America was designed by James Rich Steers and George Steers (1820–1856) (See George Steers and Co). Traditional "cod-head-and-mackerel-tail" design gave boats a blunt bow and a sharp stern with the widest point (the beam) placed one-third of the length aft of the bow. George Steers' pilot boat designs, however, had a concave clipper-bow with the beam of the vessel at midships. As a result, his schooner-rigged pilot boats were among the fastest and most seaworthy of their day. They had to be seaworthy, for they met inbound and outbound vessels in any kind of weather. These vessels also had to be fast, for harbor pilots competed with each other for business. In addition to pilot boats, Steers designed and built 17 yachts, some which were favourites with the New York Yacht Club. America was captained by Richard Brown, who was also a skilled member of the Sandy Hook Pilots group, renowned worldwide for their expertise in manoeuvering the shoals around New York Harbor. They were highly skilled racers as a result of impromptu races between pilots to ships in need of pilot services. Brown had sailed aboard a pilot boat designed by George Steers, of whom he was a personal friend. He chose as first mate Nelson Comstock, a newcomer to yacht racing. America model in Musee de la marine. Crewed by Brown and eight professional sailors, with George Steers, his older brother James, and James' son George as passengers, America left New York on June 21, 1851 and arrived at Le Havre on July 11. They were joined there by Commodore Stevens. After drydocking and repainting America left for Cowes, Isle of Wight, on July 30. While there the crew enjoyed the hospitality of the Royal Yacht Squadron while Stevens searched for someone who would race against his yacht. The British yachting community had been following the construction of America with interest and perhaps some trepidation. When America showed up on the Solent on July 31 there was one yacht, Laverock, that appeared for an impromptu race. The accounts of the race are contradictory: a British newspaper said Laverock held her own, but Stevens later reported that America beat her handily. Whatever the outcome, it seemed to have discouraged other British yachtsmen from challenging America to a match. She never raced until the last day of the Royal Yacht Squadron's annual members-only regatta for which Queen Victoria customarily donated the prize. Because of America's presence, a special provision was made to "open to all nations" a race of 53 miles (85 km) 'round the Isle of Wight, with no reservation for time allowance. The race was held on August 22, 1851, with a 10:00 AM start for a line of seven schooners and another line of eight cutters. America had a slow start due to a fouled anchor and was well behind when she finally got under way. Within half an hour however, she was in 5th place and gaining. The eastern shoals of the Isle of Wight are called the Nab Rocks. Traditionally, races would sail around the east (seaward) side of the lightship that marked the edge of the shoal, but one could sail between the lightship and the mainland if they had a knowledgeable pilot. America had such a pilot and he took her down the west (landward) side of the lightship. After the race a contestant protested this action, but was overruled because the official race rules did not specify on which side of the lightship a boat had to pass. This tactic put America in the lead, which she held throughout the rest of the race. At one point the jib boom broke due to a crew error, but it was replaced in fifteen minutes. On the final leg of the race the yacht Aurora closed but was 18 minutes behind when America finished shortly after 6:00 PM. Legend has it that while watching the race, Queen Victoria asked who was second, and received the famous reply: "There is no second, your Majesty." 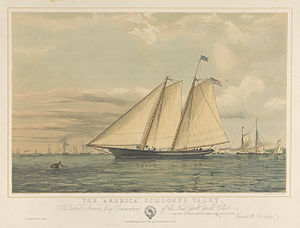 John Cox Stevens and the syndicate from the New York Yacht Club owned the America from the time she was launched on May 3, 1851 until ten days after she won the regatta that made her famous. On September 1, 1851, the yacht was sold to John de Blaquiere, 2nd Baron de Blaquiere.. In late July 1852, America ran aground at Portsmouth, Hampshire and was damaged. De Blaquiere raced her only a few times before selling her in 1856 to Henry Montagu Upton, 2nd Viscount Templetown, who renamed the yacht Camilla but failed to use or maintain her. In 1858, she was sold to Henry Sotheby Pitcher. Pitcher, a shipbuilder in Northfleet, Kent, rebuilt Camilla and resold her in 1860 to Henry Edward Decie, who brought her back to the United States. Decie sold the ship to the Confederate States of America the same year for use as a blockade runner in the American Civil War. Decie remained aboard as captain. During this time she may have been renamed Memphis but the details are unclear. In 1862, she was scuttled in Dunns Creek, north of Crescent City, when Union troops took the city of Jacksonville. She was raised, repaired and renamed America by the Union, and served the United States Navy on the blockade for the remainder of the war. America was armed with three smooth bore bronze cannon designed by John A. Dahlgren and cast at the Washington Navy Yard. A 12-pounder was located on the bow and two 24-pounders were placed amidships. Each 24-pounder weighed 1,300 pounds (590 kg) and had a range of 1,140 yards (1.04 km) at an elevation of four degrees. Assigned to the federal blockading squadron off Charleston, South Carolina, she was on patrol the night of 19 March 1863, when she spotted the smoke of a blockade runner near Dewees Inlet, South Carolina. She immediately launched colored signal flares to alert the rest of the fleet. The runner proved to be the CSS Georgiana, which was described in contemporary documents as the most powerful Confederate cruiser then afloat. America's action ultimately resulted in the Georgiana's wreck and destruction. Georgiana was undoubtedly the most important vessel to be captured or destroyed by the federal blockade. After the war, America was used as a training ship at the U. S. Naval Academy. On August 8, 1870, America was entered by the Navy in the America's Cup race at New York Harbor, where she finished fourth. America remained in the U.S. Navy until 1873, when she was sold to Benjamin Butler for US$5,000. Butler raced and maintained the boat well, commissioning a rebuild by Donald McKay in 1875 and a total refit of the rig in 1885 by Edward Burgess to keep her competitive. Upon Butler's death in 1893, his son Paul inherited the schooner, but had no interest in her, and so gave her to his nephew Butler Ames in 1897. Ames reconditioned America and used her occasionally for racing and casual sailing until 1901, when she fell into disuse and disrepair. America was sold to a company headed by Charles Foster in 1917, and in 1921 was sold to the America Restoration Fund, who donated her to the U. S. Naval Academy in Annapolis. She was not maintained there either, and by 1940 had become seriously decayed. On March 29, 1942, during a heavy snowstorm, the shed where America was stored collapsed. Three years later, in 1945, the remains of the shed and ship were finally scrapped and burned. The first replica of America was built by Goudy & Stevens Shipyard in Boothbay, Maine and launched in 1967. She was built for Rudolph Schaefer, Jr., owner of F. & M. Schaefer Brewing Co. Construction was supervised by her first skipper, Newfoundland born Capt. Lester G. Hollett. A second replica of America was built in 1995 by Scarano Boatbuilding of Albany, NY for Ray Giovanni and was operated by him for commercial events until his death. The replicas had several modifications from the original design including widening the beam by 4 feet to accommodate interior layouts. The original design had only one lantern (skylight) so three were added to bring light into the interior of the yacht. The yacht spent several years in Key West Florida and now operates whale watching and racing tours out of San Diego. She was exhibited in June 2011 in San Francisco Bay in concert with exploratory preparations by the Oracle Racing team for the 2013 America's Cup race, to be held within the bay. She is now owned by Troy Sears's company Next Level Sailing, and sails around the world as an official licensed partner for the America’s Cup Tour. A third replica was built in Varna, Bulgaria in 2005. Christened Skythia, the boat's home port today is Rostock, Germany, where she is used for commercial charter. ^ a b c Bruzek, Joseph C. (November 1967). "The U. S. Schooner Yacht AMERICA". United States Naval Institute Proceedings: 174–176. ^ "The Yacht America – Royal Yacht Squadron". ^ "Death of George Steers" (pdf). The New York Times. 26 September 1856. Retrieved 2012-04-26. ^ Chapelle, Howard (1949). "The History of the American Sailing Ships". W.W. Norton & Company: 307–316. ^ Coffin, Roland Folger (1885). The America's Cup: How it was Won by the Yacht America in 1851 and Has Been Since Defended. Charles Scribner's Sons Press. pp. 9–10. Retrieved 2012-04-26. ^ a b c Rousmaniere, John (1986). 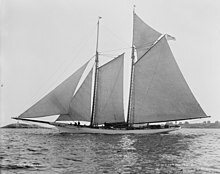 The Low Black Schooner: Yacht America 1851–1945. Mystic Seaport Museum Inc. pp. 34–38. ISBN 0-939510-04-9. ^ "Miscellaneous". The Blackburn Standard (916). Blackburn. 4 August 1852. ^ Spence, Dr. E. Lee (1995). Treasures of the Confederate Coast: The Real Rhett Butler & Other Revelations. Narwhal Press. pp. 62, 63, 221–225. ^ a b "Shipwreck 1863 "Georgiana"". Archived from the original on 2012-04-14. Retrieved 2012-04-26. ^ Sparkman & Stephens. "Sailboats over 100ft LOA". Retrieved Feb 21, 2013. ^ "Capt. Hollett Going Home After 56 Years Of Service". Bangor Daily News. Jan 31, 1973. Retrieved Feb 21, 2013. Wikimedia Commons has media related to America (ship, 1851). Jacques Taglang. "AC-clopedia – Americaʼs history". americascup.com. "AMERICA Cup 1851 AMERICA" (in German). Klaus Kramern.